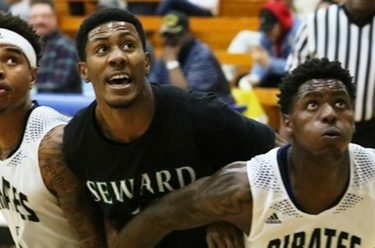 The Seward County Saints were hoping that a three week layoff and a new year would help them get things turned around as they began the second half of their 2016-2017 season Wednesday night in Independence, however, it was more of the same for the guys in green as they yielded 51 first half points and never recovered in a 95-82 loss to drop their third straight in conference play. Seward outshot the Pirates overall in the first half, but the Saints were just 2 for 10 from downtown while Indy was 8 for 16 and the Pirates also corralled 8 offensive rebounds in the period, turning them into 12 second chance points. Kevin Sims led the Saints with 17 first half points while Charles Beauregard had 9. Finding a way to get stops continued to be an issue for the Saints as the second half began with Independence pushing their lead to 12 early in the period at 63-51. Just as Seward tried to make a push, a pair of whistles went against them for illegal screens on the offensive end on back to back possessions, turning an 8 point deficit quickly back to 12 with 9:19 to go. Seward continued to find a way to put the ball in the basket and marched their way to the free throw line with regularity, but the Pirates were able to do the same as a three from Beauregard from the corner found the bottom of the net with 2:39 to go, but was only enough to cut the Saints hole to 86-75. In the end, it was not the night for the Saints to break through as Independence finished them off 95-82 to send Seward to a disappointing third straight loss in Jayhawk Conference play. Seward finished the night shooting under 40% as a club, including just a 34% mark in the second half of play. Independence shot 45% in the contest and outrebounded Seward 52-40 including 16 offensive rebounds on the night. Sims led Seward with 25 points while Beauregard had 15 despite just a 3 for 15 shooting effort. Ernest Carter tried to spark the Saints off the bench giving them a career high 9 points to go along with 9 rebounds in 24 minutes. The loss drops Seward into extremely unfamiliar territory as at the 10 game mark of the conference season, the Saints find themselves on the bottom of the league standings, looking up at the rest of the league with a 2-8 mark and a 5-9 overall record. Independence takes a huge leap with the win, jumping back into the fold at 7-6 overall and 4-6 in conference play. The Saints will try to get back on track Saturday night as they return home on Hall of Fame Night in the Greenhouse when they host Colby in an 8:00 tip. Free tickets are available courtesy of our buyout sponsor Sharp, McQueen, PA at their Liberal offices, or at Hutch’s, Community Bank, and Toot n Totem in Liberal.